KIDS OCEAN DAY Adopt-A-Beach Clean-Up is at Dockweiler State Beach on Thursday, May 23, 2019, for the 26th year. 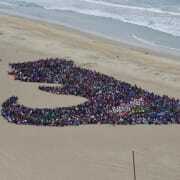 Thousands of elementary students are brought together for a beach clean-up and a kid-formed Aerial Art message. The kids will also form individual shapes on the beach.